There is NO WAY that the team to mess up against SM North will be ONW. Come on Ravens! @EagleGrad, it was a helluva game! SMN held tough and played great offensively against the Ravens D.
ONW played well though, their RB #14 is a horse. Probably by far the strongest player on their team. Safe to say that Olathe East has been exposed. Good job Cougs! C'mon Vikes getting better every week, let's smoke the fading Hawks next week. Olathe East is a tough program to figure out, but the bottom line is always the same: they finish with a winning record and a playoff berth every single year. While they haven't looked good lately, I wouldn't at all be surprised if they closed at 3-1 and enter the playoffs at 6-3 overall. They have some things to iron out for that to happen, but it seems like they typically find a way to iron out their issues in the regular season. But maybe this is the year they don't? Who knows. The next four weeks will be fun. Olathe East was down two key starters last night, Jalen Branson and Derek Miller. Also, their other injured starter, James McGinnis, was moved to an out of state rehabilitation facility this week as he recovers from his brain injury. OE was vulnerable this week, and SMNW capitalized on it. 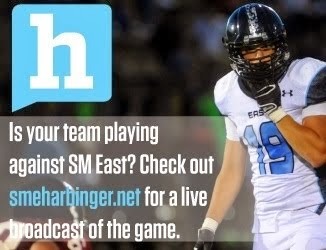 In regards to OE v. SMN, or ONW v. SMN for that matter, the days of SMN being shut out are behind them. There is some serious talent on that team, along with excellent coaching. The SMN QB as a sophomore looks better than Ryan Willis did as a sophomore. It will be fun to watch SMN and their QB develop in the next few seasons. Don't sleep on SMN, they will upset someone who isn't prepared. He's probably is the strongest but he's definitely not the best running back on the roster. Look for #41 Dominique Bruce. He led the team in rushing with 8 carries for 99 yards. #14 only had 74 yards despite what Kansas City Star wrote. It was inaccurate. Don't count Free State out yet, they have some of the injured players returning this week and next. Just in time for playoffs. This team can still be a solid contender. They have played strong against a couple of the top two opponents in the sunflower league, so don't sleep on them.